A crucial part of moving away from carbon fuels is uuh, moving away from fossil fueled cars. You can close every coal plant in the world but we would still be spewing CO2 out of our cars and trucks in prodigious amounts. It's about 14% of our total total emissions. So, moving to electric drive is essential to a successful strategy. 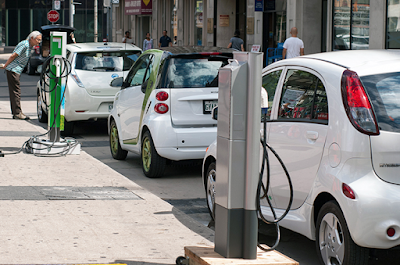 "In a report released Thursday, Driving Out Pollution: How Utilities Can Accelerate the Market for Electric Vehicles, we explain how the electric industry could accelerate the national EV market by helping to deploy charging stations where drivers live, work and play; increasing public awareness of EVs’ economic and environmental benefits; and incentivizing drivers to charge their cars at times that will help bring more solar and wind energy onto the grid. The report details how the electric industry can use spare capacity in the grid to charge our nation’s vehicle fleet, partner with independent EV charging companies to increase access to electricity as a transportation fuel and maximize fuel cost savings relative to gasoline by offering lower rates for charging during periods when the grid is underutilized and/or excess renewable power is available. According to a recent paper published by the National Academy of Sciences, the share of new vehicles sold that are electric vehicles needs to grow from today’s 1 percent, to 40 percent or more by 2030 to avoid the worst impacts of global warming. Thanks to the Volt, the Leaf, and Tesla, Electric Drive is happening. In 2015, the number of electric cars on the road globally passed the one million threshold for the first time. The rapid growth of the industry means that it is now the only technology sector on track to meet the International Energy Agency’s (IEA) 2C scenario. "In 2015, sales of electric cars around the world amounted to 477,000, taking the total volume up to 1.15m. Sales grew by 70 percent over 2014 levels. The IEA says that this means it is catching up with the rates needed to meet the 2DS. The U.S., China, Netherlands and Norway accounted for 70 percent of all the electric cars sold worldwide. In 2015, China became the world’s largest electric car market. But growth was also occurring outside these countries. The number of countries with a market share of electric cars greater than 1 percent grew from three in 2014 to six in 2015." Everyday now I see more and more electric drive vehicles. And the list of available EVs is getting pretty long. I'm on my third year with my ELR now and it's a blast to drive. Electric Drive spoils you. And perhaps more importantly, it's better for you. The other night at dinner, I blurted out that since I started using electric drive, my health is better. Maybe we are all a little allergic to gasoline, and we just never put it together. Over the last two and half years, I have filled my plug in hybrid up perhaps 10 times. And in that period, I have not had the flu, nor have my allergies flared like they used to. Imagine the true health value of reduced hydrocarbons in the air that we breathe. Now imagine the value of zero hydrocarbons in the air we breathe. More importantly, imagine what we might save. Our lungs? Our minds? Our auto-immune systems?